This is a silicon wafer containing about 750 Intel 386 processors. Even though it is over 15 years old, I still marvel at the hundreds of processors each with their millions of microscopic transistors. 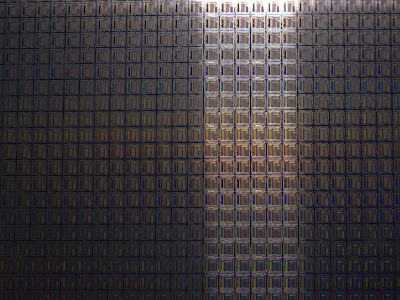 Here's a link to a super closeup photo of a single processor from this wafer. Canon G10, 1/20 sec at f/4.5, ISO 400.